The US stock markets finished September much like it spent the past three months, quietly grinding higher. The S&P 500 Index rose 4% in the third quarter to fresh records, but the index’s average daily move during the period was 0.3%, the lowest since 1968. Solid earnings and decent economic data helped support major indexes this past summer, with trading largely remaining calm despite disruptive hurricanes and threats between the US and North Korea. As nice as the returns have been domestically, international stocks this year have been even stronger. The broad‐based EAFE index of companies in developed foreign economies gained nearly 5% in the recent quarter, and is now up 17% in dollar terms for the first nine months of calendar 2017. In aggregate, European stocks have gone up 19% so far this year, while EAFE’s Far East Index has gained 12%. Emerging market stocks of less developed countries, as represented by the EAFE EM index, rose 7% in the third quarter. In the bond markets, the 10‐year US Treasury bond rate has risen incrementally from 2.30% at this point three months ago to 2.33% at the end of September, while 30‐year government bond yields have also risen incrementally, from 2.83% to 2.86%. The real ac on has been seen in short‐term rates, where the 2‐year US Treasury bond yield has risen to 1.47% in anticipation of another Federal Reserve rate hike in December of this year; the US 2‐year was at 1.24% on June 30th. Central banks continue to exercise a high level of influence on financial markets. In our summer 2017 commentary, we discussed the Federal Reserves’ plan to begin reducing its balance sheet, and we predicted that they would likely commence implementing this plan in the fall. Indeed, at its September meeting, the Federal Reserve announced that starting in October they will allow $6 billion of Treasury securities to roll off its balance sheet monthly as they mature. That amount will rise by $6 billion every three months over the course of a year, at which point the central bank will be rolling o $30 billion in Treasury bonds each month. 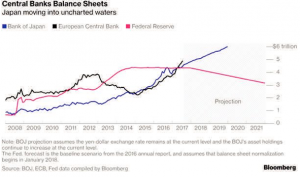 While the US Federal Reserve is starting to reduce its balance sheet, the European Central Bank (ECB) and the Bank of Japan (BOJ) are still expanding their balance sheets. The ECB and BOJ are engaged in their own “Quantitative Easing” (QE) programs that are intended to stimulate their economies and prevent deflation. The chart to the right illustrates the magnitude of the ECB and BOJ expansion. Given the relentless rise in global asset prices and the sheer magnitude of global central bank balance sheet expansions, it is worth considering how much the QE flow of funds is contributing to the rally. The link between QE flow and asset prices makes intuitive sense. The world’s stock of savings is held in two places: cash and everything else (“financial assets”). QE, by its nature, increases the supply of cash in the world, and simultaneously decreases the supply of non‐cash financial assets, by removing government bonds, corporates, and in some cases equities from circulation. Those securities are replaced in the financial system by cash of equivalent value. Effectively, QE increases the ratio of cash to financial assets worldwide, and that ratio reflects the relative abundance or scarcity of cash available to purchase each unit of assets. QE’s influence on that ratio drives up the price of financial assets, all else being equal. 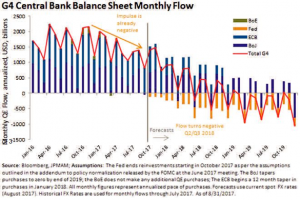 This rationale suggests that it is the flow of QE – the speed with which cash is injected and financial assets are removed – that influences the change in asset prices. When QE flow is positive, asset prices go up; conversely, when QE flow is negative, asset prices go down. 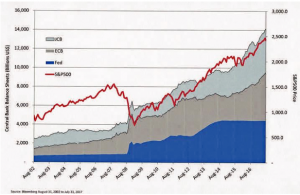 However, despite this simplicity, the relationship between balance sheets and asset prices is still a matter of intense debate. As the next chart illustrates, it is hard to argue that the unprecedented global central bank expansions of the last 8 years have not had an influence in the steady ascent of financial markets. JP Morgan’s Macro economic Strategist Andrew Norelli recently argued that “the impulse, rather than the flow, of global central bank balance sheets is likely to be the primary driver of asset prices.” Whereas the “flow” of QE is the speed of balance sheet increase, the “impulse,” is its acceleration. If the speed of balance sheet growth is slowing down, impulse is negative. This analysis puts us at an interesting crossroads. As discussed earlier, the US Federal Reserve will begin reducing its balance sheet this month, gradually moving from a $6 billion per month roll off to a $30 billion per month roll off next year. The European Central Bank (ECB) plans are more di cult to discern at the moment. The ECB is widely expected to start unwinding its QE in 2018, spurred by improvements in European economies and amid fears over shortages of eligible bonds to purchase. The ECB is currently purchasing 60 billion euros per month in “eligible securities” – including European corporate bonds – and it is expected that they will gradually reduce their purchases to 30 billion euros per month beginning in January 2018. The Bank of Japan (BOJ) plans are less certain. Since embarking on their QE programs in 2013, the BOJ’s balance sheet has swelled to over 502 trillion yen, equal to $4.6 trillion US dollars, which now exceeds the US Federal Reserve balance sheet. The BOJ recently signalled that they will attempt to spur inflation by using interest rate targeting, which could affect their asset purchases. The US Federal Reserve’s recent focus on shrinking the size of their balance sheet suggests they believe it is the size of their balance sheet, rather than the flow or impulse, which impacts markets and the economy. By that rationale, the current $4.5 trillion balance sheet remains highly simulative; if they want to remove part of the stimulus their balance sheet policy provides, they believe they need to shrink it, and that as long as their balance sheet size is above a certain lower theoretical level, its size alone is still simulative rather than neutral or negative to economic growth. We will soon find out if the current stable balance sheet size is neutral for the US, and whether attempts to shrink it will be impactful for markets and the economy. It could be that neutrality on a domestic level is overwhelmed by QE expansion still going on elsewhere, most notably by the Bank of Japan. As the chart shows, global central bank flow is projected to turn negative around Q2‐Q3 2018. Given the uncertainties surrounding the potential outcomes from these changes in global central bank policies, we recommend investors review their portfolio risk profile. Perhaps the central bank balance sheet projections are simply another brick in the proverbial “wall of worry” that a strong bull market climbs. At this moment, the fundamental underpinnings of this market are strong. Solid corporate earnings, combined with a growing global economy and resilient consumer confidence, should continue to support the stock market. We will continue to monitor events and make changes as necessary.